Remote Display Multimeter Fluke 233. Using the Fluke233 remote digital thermometer you can work at two places in same time. Such a multimeter is very in suitable performing test and measurements at hazardous environments. Standing on ladders, tangling long test cables, calling a second guy for at the desired location and perform the test/measurement from a convenient place through the detachable wireless display module. The Fluke 233 is a gadget that will surely make your work much easier. The fluke233Â Â is packed with a lot of good features that will make your job a wonderful experience. The built-in thermometer allows you to make temperature measurements without the help of an additional tool. The radio transmitter of the Fluke233 automatically turns off. When the detachable display is plugged into the multimeter body. There is also an auto power OFF feature that saves the battery life. The easy to read display has large digits and a bright backlight. 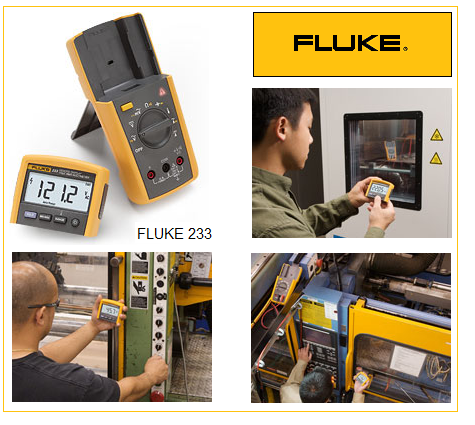 Fluke233 can be used as a conventional DMM when the display is plugged into the multimeter. Battery life is around 400 hours. The true RMS AC voltage and current make it possible to measure non-linear signals accurately. DC voltage rangeÂ Â Â Â Â Â Â Â Â -Â Â Â 0.1mV to 1000V DC. AC voltage rangeÂ Â Â Â Â Â Â Â Â -Â Â Â 0.1mV to 1000V AC. DC current rangeÂ Â Â Â Â Â Â Â Â -Â Â Â 1mA to 10A. Resistance rangeÂ Â Â Â Â Â Â Â Â -Â Â Â o.1WÂ to 40MW. Capacitance rangeÂ Â Â Â Â Â Â -Â Â Â 1nF to 9999mF. (1nF resolution). Frequency rangeÂ Â Â Â Â Â Â Â Â Â -Â Â Â 5Hz to 50kHz (0.01Hz resolution). Temperature rangeÂ Â Â Â Â Â -Â Â Â -40Â oC to +400Â oC. Wireless transmitterÂ Â Â Â Â -Â Â Â 2.4GHz ISM band transmitter with 10 meter range. BatteryÂ Â Â Â Â Â Â Â Â Â Â Â Â Â Â Â Â Â Â Â Â Â -Â Â Â 3AA batteries for the multimeter main body 2AA batteries for theÂ detachable display module. WarrantyÂ Â Â Â Â Â Â Â Â Â Â Â Â Â Â Â Â Â Â -Â Â Â 3 years.